A barrage of lawsuits filed by Parkland victims and survivors blame Broward County Sheriff’s Office and the school district for failure to prevent the massacre and allege gross negligence by officials. Broward County Public Schools, Broward County Sheriff’s Office and a mental health institution that treated the gunman Nikolas Cruz, who went on a shooting spree inside Marjory Stoneman Douglas High School in February 2018, have been bombarded by almost two dozen lawsuits announced by representatives of 26 families and survivors of the school shooting on Wednesday. 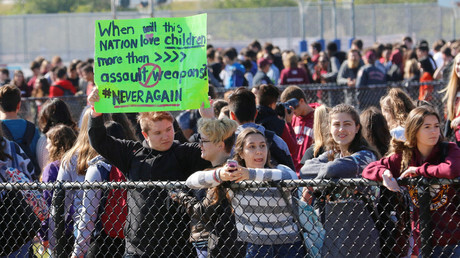 The lawsuits, part of which have already been filed and the rest are expected to be finalized by the end of the week, argue that former Former Broward Sheriff’s Deputy Scot Peterson, who was the only armed officer at the school, and campus monitor Andrew Medina should bear responsibility for not following the relevant guidelines that could have averted the rampage. One of the lawsuits, filed on behalf of Samantha Mayor, a 17-year-old student wounded in the attack, argues that Peterson “wantonly and willfully disregarded BSO policies and procedures by not immediately entering or attempting to enter…for the purpose of locating and neutralizing” the shooter. Instead of trying to subdue the attacker, Peterson was “waiting outside the school for an inordinate amount of time” putting the staff and students at more risk, the lawsuit charges. The claim further alleges that by ordering an immediate lockdown on the school, Peterson prevented students from fleeing and thus prolonged their ordeal. The lawsuit claims that Peterson might have prevented the massacre altogether if he took appropriate action when tipped off to Cruz’s intention to “shoot up the school.” Back in February 2016, Cruz’s neighbor alerted police of the Instagram post in which the would-be gunman threatened to do exactly that. The information was forwarded to Peterson at the time, who failed to sound the alarm. Medina who was the first person to spot the shooter, recognizing him as a “crazy boy” and seeing him entering the building, has been accused of “willfully disregarding” his duties by not calling ‘code red’ as he was supposed. Instead, Medina alerted Peterson and did not take further action, waiting outside. The lawsuit argues that Henderson had “at least three opportunities” to initiate the enforcement of a mental health act against Cruz that would have prevented him from purchasing firearms in the first place. The legal action has been launched by thirteen law firms on behalf of the families of slain victims and survivors, as they claim that the school district authorities hired a lobbying firm to not pay the compensation they had originally vowed to provide. “What we’ve learned in the past 14 months is that they have no intention to help,” Todd Michaels, attorney for the family of a killed student said Wednesday. However, a spokesman for Broward County Public Schools dismissed the accusation, claiming that it had brought in lobbyists to advocate for and not against the compensation fund. 17 students and staff were killed in the deadly Parkland shooting, that reignited the debate over gun laws and sparked mass protests across the US.